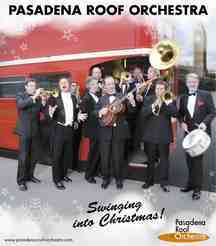 The orchestra's 40th Anniversary Concert DVD out now! Live from Cadogan Hall. In HD, 5.1 Mix and bonus material showing a documentary about the Orchestra's history! Get it now, it's hot! 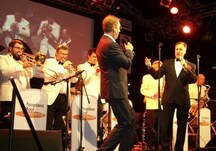 Saturday, 25.06.2011 23:25 (German time) the German TV station 3sat is going to broadcast the live show with Pasadena Roof Orchestra & The Puppini Sisters which has been captured this February. The Orchestra's new studio CD is out now! The band's current library has been shaken again - not stirred! And here is the new cocktail: Licensed To Swing. The recipe is simple: take some superb arrangements, add a dash of hot jazz, and a slice of integrity, and then just enjoy some great music from this period. 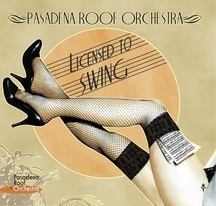 It was 'love at first sight' as Marcella Puppini said when the Pasadena Roof Orchestra and The Puppini Sisters worked together for the first time. 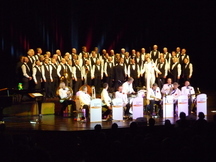 Two concerts in Ludwigshafen, Germany as part of BASF's cultural activities attracted about 2500 people to see this unique collaboration. Judging by the loud applause, it was an instant success. The unique performance from both artists was captured by German TV station SWR to be broadcast later. 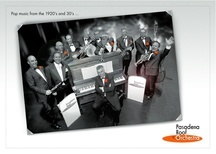 The Pasadena Roof Orchestra wishes all fans, agents, venues, promoters, festival organizers, media partners a Happy and Prosperous New Year 2011! Come and enjoy an evening of Christmas songs, ballads and timeless classics of the 1920s and 1930s, played with The Pasadena Roof Orchestra's inimitable style and panache! Recently, the Pasadena Roof Orchestra had packed houses on its mini tour through Germany where they performed in Berlin-Koepenick and Trier. 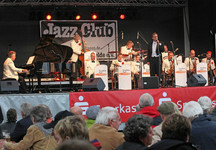 The "Jazz In Town"-Festival in Koepenick was celebrating its 15th Anniversary. In 15 years, believe it or not, the Pasadena Roof Orchestra has been performing there seven times. This year's appearance had a surprise for the audience as well as for the promoter. Singer Robin Merrill (orchestra member from 1979-1989) and meanwhile living in Berlin got a front seat in the audience and joined the show at the end of the 2nd half singing along together with Duncan Galloway "Puttin' On The Ritz". Take some high mountains, a large blue lake, a picturesque town, a few stages, and a roster of international artists, mix it all together over 10 days and you have the 26th edition of the Ascona Jazz festival. The Pasadena Roof Orchestra was one ingredient last weekend, and entertained the festival crowd on two nights on two different stages. Despite some spectacular storms on the Saturday, the orchestra's performance went down very well. A real fan's enthusiasm won't be dampened by a little rain! The Pasadena Roof Orchestra very much enjoyed its mini tour in the Spanish sun last week. 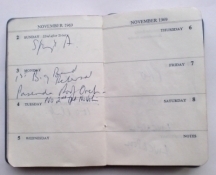 Scheduled were concerts in Madrid and Barcelona. In particular the packed El Palau de la Musica Catalana, one of the finest concert halls in Europe, wowed the Orchestra's members again. 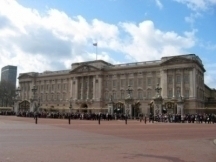 Judging by the warm and long applause the orchestra received it would seem they were wowed too. 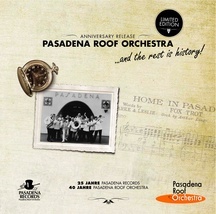 A special Anniversary Record was released by the Pasadena Roof Orchestra for the German-speaking market: A vinyl EP containing six tunes from 40 years. This record is strictly limited to 1000 units only. Each album cover has a unique serial number and makes this EP a highly collectable item! Germany is celebrating the 20th anniversary of its unification. Nov 9th 1989 was the historic day when the Berlin wall came down and the border between East and West Germany was opened. Last week the Pasadena Roof Orchestra toured some East German cities just as it did in the late 1970s and 80s when they were one of the very few Western artists who were allowed to perform in the DDR. So great was the Orchestra's popularity that in 1988 the album "Happy Feet" was licensed to AMIGA and released in the DDR. 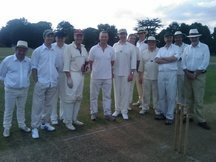 On Monday, Aug 24th the Pasadena Roof Orchestra again showed its talents at the band's annual cricket match. 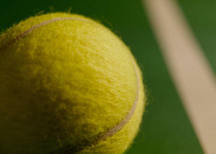 The player's skills were as usual outstanding and even better at demonishing the sandwiches and cakes at tea time, at the bar afterwards, and the evening blow in the pavilion. On June 27th the Orchestra took its place amongst the beautifully manicured croquet lawns and cricket pitches of the Hurlingham Club in London. 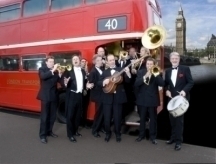 The Band performed at the Lawn Tennis Association Wimbledon Ball. 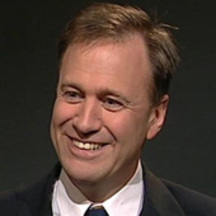 The orchestra's bandleader Duncan Galloway appears on Bavarian TV, BR alpha, Monday June 29th at 20:15 and Tuesday June 30th, 13:00. After only two years, the "Bietigheimer Wunderland" festival at Bietigheim-Bissingen near Stuttgart has developed its very own special magical atmosphere. The Orchestra started its festival summer with two very well-attended performances at the "Wunderland" under starry skies. 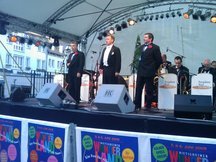 Over two days, more than 20.000 people experienced various shows, acts and bands, spread over six stages throughout the historic centre of Bietigheim. HOW CONVENIENT CAN A GIG BE? May 14th the Pasadena Roof Orchestra had possibly the distance of a well struck 8- Iron to travel after arriving in Hamburg. 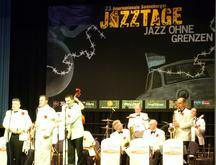 The concert was held at Terminal Tango, Hamburg Airport's old departure terminal which functions as event location now. 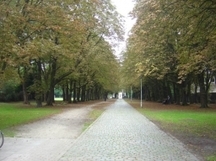 But not only the venue, also the hotel was in walking distance. 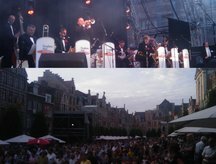 Waiting feverishly, the orchestra prepares itself for a hot summer with engagements at venues around Europe - open air concerts, jazz festivals as well as 'Moonlight Serenades' on (hopefully) warm summer nights will form the orchestra's schedule. Isn't it romantic? - as one of the band's first albums were named - hearing all those melodic tunes under 'Blue Skies'. Yes, he did it again! 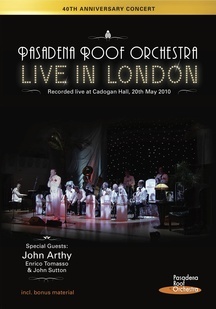 Pasadena Roof Orchestra's Founder John Arthy was back on stage performing a few numbers with the orchestra's current line-up on a one week tour through Bavaria and Austria. Timeless music at an timeless venue. 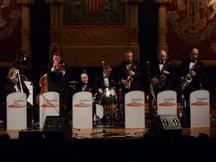 The Pasadena Roof Orchestra enjoyed a concert in Barcelona's special theatre - El Palau de la Musica Catalana. WELCOME TO OUR NEWLY RELAUNCHED WEBSITE! 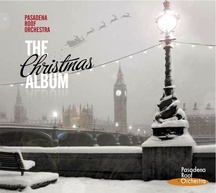 The Pasadena Roof Orchestra plays across Europe and all over the world. Listen to authentic sounds from the swinging 20's and 30's. Come and visit our stage shows. We're looking forward to seeing you!